Fuel gets wasted from poor driving behavior (like speeding), unnecessary idling and unnecessary miles driven that a GPS fleet tracking system can help identify. Our customers have reported anywhere from 12-30% savings on fuel after implementing our system. Optimize driving routes; find the shortest routes with the least amount of traffic to get to destinations faster. Get to your customers on time and send the closest drivers to the closest call. Without a fleet management system vehicles are usually either serviced at regular intervals or service is forgotten altogether. This can cause a few problems, either the vehicles are getting serviced when no maintenance is actually needed or vehicles are overdue on their maintenance. 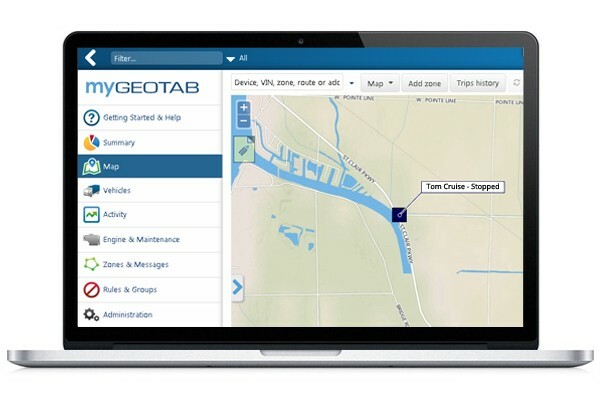 With our fleet management system you can set up alerts for maintenance and the system will alert you of any engine faults. You will no longer need to pay high priced mechanics to find out what is wrong, our software can tell you. Time is money and with our fleet management system get accurate records of driver hours. Eliminating manual time sheets will please your drivers and your administrative staff. Eliminate speeding, rapid acceleration and harsh braking. Fleet managers will be able to access important data about driver behavior and can identify pain areas to discuss with their drivers. Our in-vehicle driver training ‘beeps’ will also alert drivers immediately of any poor behavior allowing them to correct the negative actions themselves. Unauthorized and after-hour use of the company vehicles can be easily identified and controlled with real-time data and alerts from our fleet management system. GPS tracking technology allows fleet dispatchers to use real-time location for time-sensitive dispatching. It enables dispatchers to identify any delivery/service route overlaps and difficult traffic areas to avoid. Many insurance companies offer discounts to businesses taking advantage of GPS tracking technology. Also, fleet management systems can reduce liability from worker’s compensation costs and accident claims. GoFleet has a partnership with Mutual Liberty and can offer between a 10-40% discount for fleets of 20 or more. Real time tracking makes serving your customers easier. Know which driver to send, where they are and when they will arrive to the destination. The GPS tracking data can be used to verify driver deliveries and the amount of time spent at each location. The system also removes all customer vs. driver disputes by providing the real facts. GPS fleet tracking does much more than simply ‘tracking’. Of course this feature is great but with all the advanced reporting technology, driver coaching, and alerts that come along with it your company will realize a return on investment and overall business optimization in no time.